Do you procrastinate? How about replacing high-priority actions with tasks of lower priority or do something more enjoyable, while putting off important tasks to a later time? If you are someone with a habit of putting off or delaying, especially something requiring immediate attention, then you might be a procrastinator. There’s an old Spanish Proverb, which says tomorrow is often the busiest day of the week. But seriously, if you are seeking to achieve your goals and finding purpose in your life then you need to get a handle on this procrastination thing. Believe it or not, procrastination steals your time – time you could be using more constructively. Recognize any? Well the problem is that if you buy into any of the above excuses, you have created a habit and you don’t follow-through on the steps needed to achieve your goals. In the moment, procrastination can feel good, but later on it catches up with you and creates stress and thus becomes a vicious cycle. 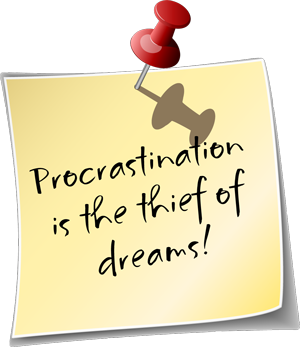 Determine the reason for your procrastination; could it be that you are lazy and don’t want to admit it. Laziness might run in the family. You will need to break that family curse and move forward… generational curses can stronghold families for years until someone breaks the chain… break the chain. It may be anxiety or stress. If so, or if you think that might be the problem, see your doctor, check it out…you never know. But remember this step is critical to you getting a handle on the cycle of procrastination in your life. 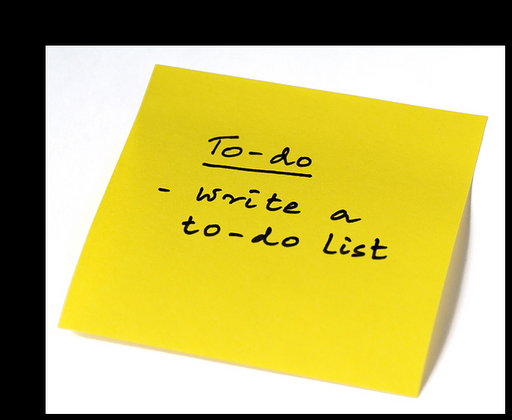 Identify the tasks needed to be done: The best thing to do is write down your tasks, even if they seem simple. A vision is the act or power of anticipating that which will or may come to be and that’s what you want to happen with your tasks… you want to see them completed. Habakkuk 2:2-3 says “Write the vision; make it plain on tablets, so he may run who reads it.” So, if you want to move forward, write down your tasks. Use old fashion paper and pencil. I know iPads and iPhones make things a lot easier, but this is different. You need to see your tasks and feel them. Write your tasks over and over, if you have to, but if that tablet is with you and you check off what you’ve completed, then you would have conquered a big chunk of what caused your procrastination. Target one task at a time until completion. Don’t multitask because this will cause anxiety and stress, and you’ll be back in your habit or pattern of excuses; looking for something easier or enjoyable to do. Stick to your tasks. Stay focused and be in the now; be aware; it keeps you alert, and use a timer if you think that will help. Don’t over prioritize. Be honest with yourself and your love ones. If you need help, let others, such as co-workers, family and friends know what they can do to help. Be specific with tasks which are handed out to others so you don’t fall into redundancy and have to go behind them and redo the task. Do your best and don’t give up. Your vision is for an appointed time and since it took time to develop this habit of procrastination, it will take time to develop a new habit of meeting your goals and seeing your vision through. Work steps 1-3 until it becomes a habit. Just as the word of God says in Isaiah 28:10, “For precept must be upon precept, precept upon precept, line upon line, line upon line, here a little, there a little”, in other words, be patient…it takes time. Getting through the tasks is the goal. The steps above will help you get a handle on your procrastination, but don’t over analyze it or try to be perfect. Just provide yourself some structure so you can accomplish and complete your tasks. 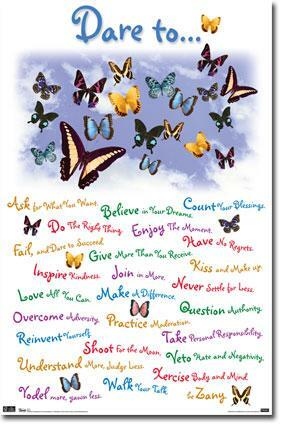 You’ll soon be on your way to achieving your goals, working your vision and living a purpose filled life. Good luck! October 6, 2012 in chores, goals, procrastination vision, tasks.